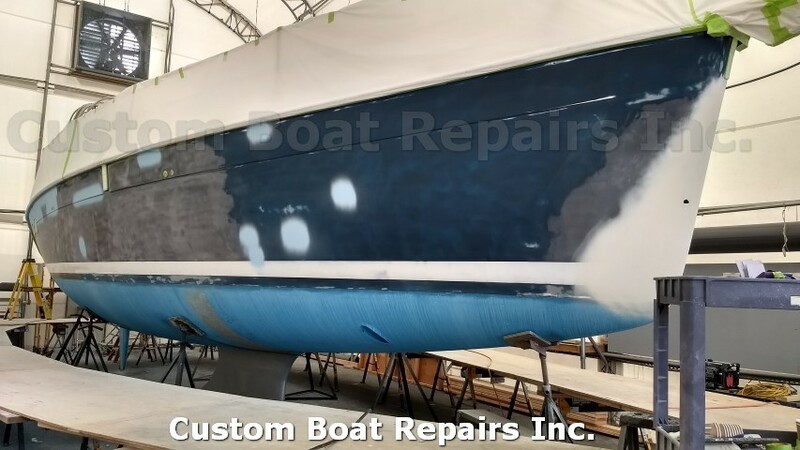 When I spray paint a boat, it's not your typical paint job. 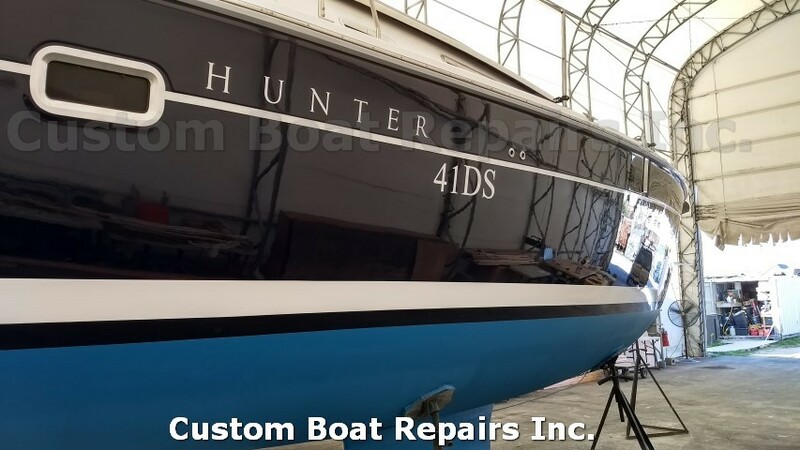 You see, many shops will sand the hull and spray two coats of color, then rip off the masking paper and consider it done. 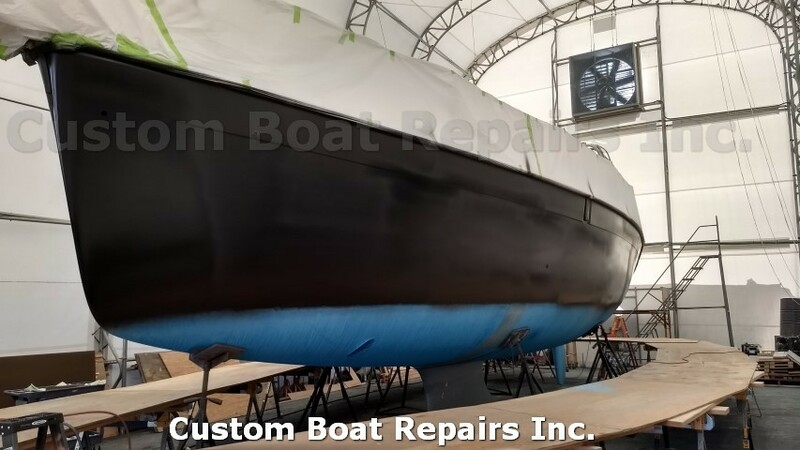 But my process involves several additional steps, which incldue sanding the hull, applying an epoxy base coat over the entire hull, sanding the primer, then applying nine coats of color, sanding in between some coats when needed, then giving the hull a final buffing so the finish comes up smooth, shiny and completely level. 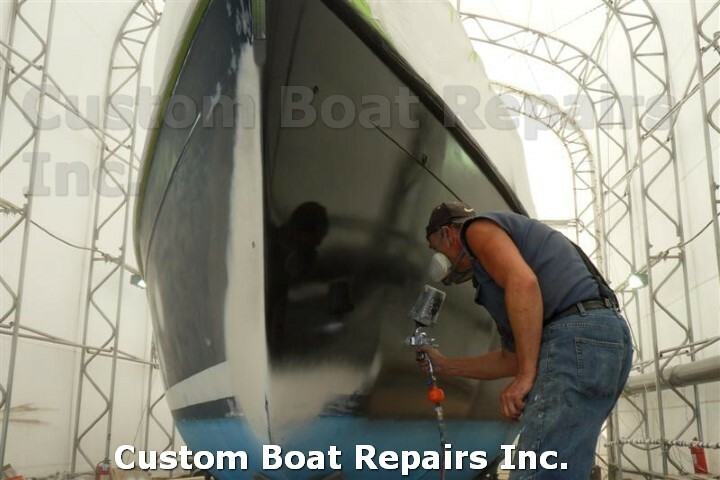 This process is very labor-intensive, and costs more then your typical paint job. But there's good reason for that. The typical paint job supplies cost around $2,000. My paint supplies, on this sailboat alone, were around $8,200. Then there's the labor, which will add to the cost. But like I said, I don't do typical paint jobs. I'm a perfectionist when it comes to not only how my completed finishes look, but hold up. I've seen some typical paint jobs that have turned out OK. But it's the little things like dust nubs in the finish, runs, orange peel, and how the finish holds up when you accidentally rub into the dock bumpers, that are the difference between a "typical" paint job and a "quality" paint job. And that lack of quality in most typical paint jobs, is what drives me crazy. 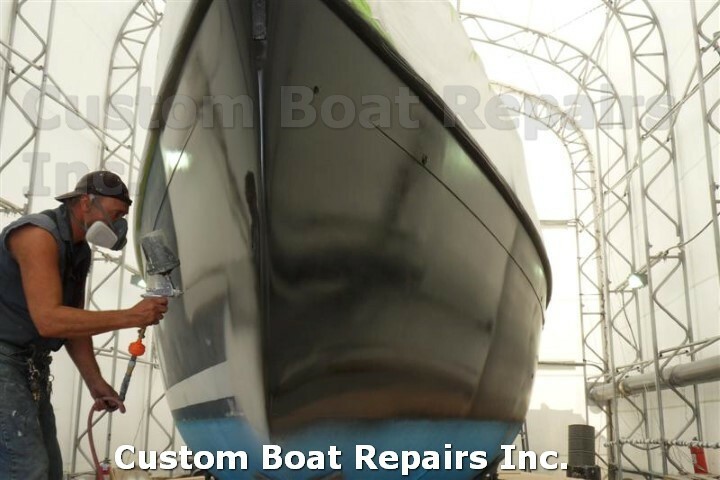 When I spray a boat, my finishes do not have orange peel, have no runs and no dirt nubs. 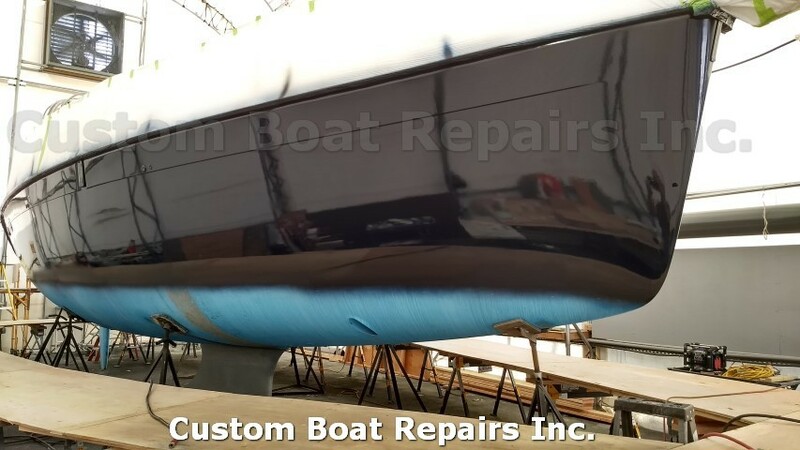 I just want to see a superior mirror finish on the boat, and I expect that you do too. I've seen many boat owners take their boats out for a cruise and accidentally rub into the dock bumpers. 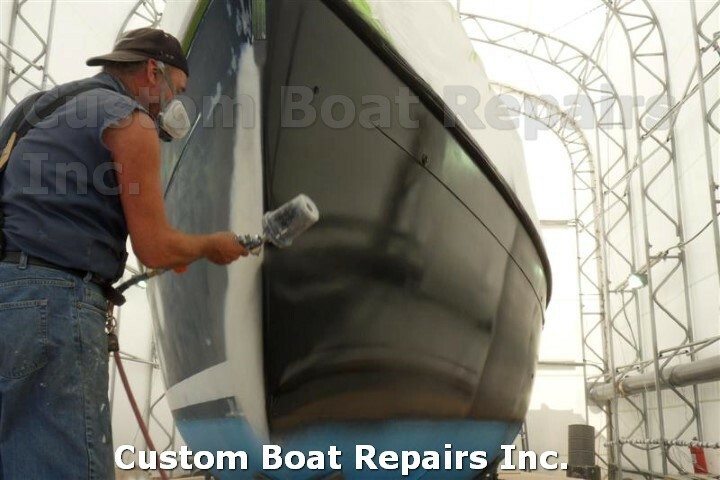 Now, if you only have two coats of color and do rub the dock bumpers and that leaves a mark on your hull, you will have to use compound to remove those marks. In my experience, I've learned that you can rub through the color really quickly, and so what you're left with is discoloration from rubbing through to the base gel coat. Now instead of one problem, you've got two. 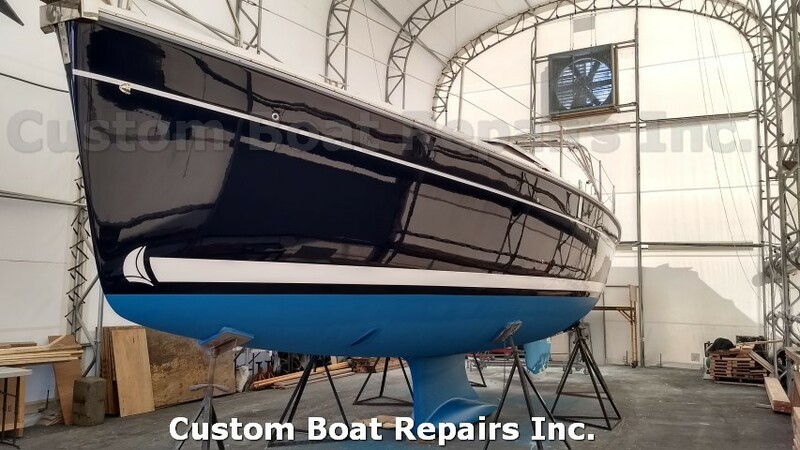 Nine or ten coats with the epoxy is more forgiving because when you buff out the rub marks, it will look brand new again. 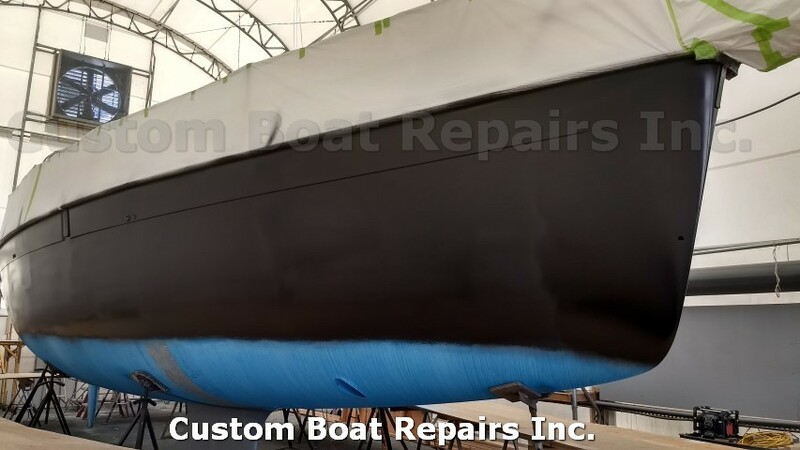 I also use this same process when I do repairs on a hull, where the color has to be blended in to match its original color. And I mix all the paint colors that I use by eye, so it ends up being a perfect match to your hull. I've actually tried getting tints from Awlgrip, but they wouldn't sell to me. They told me to send them part of the boat and then they'd mix the color for me. So, lets say I spray the boat with Awlgrip, and two years go by and you have a boat accident. 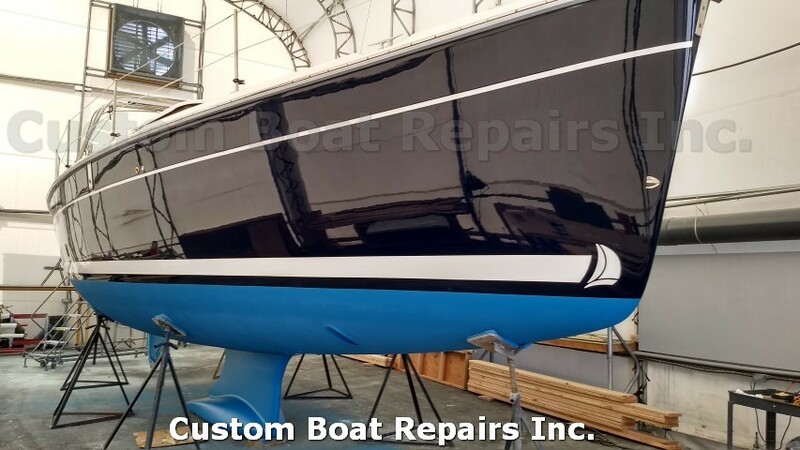 The Awlgrip stock color will not match the color of your boat now, because the sun and its UV rays have obviously changed its color. 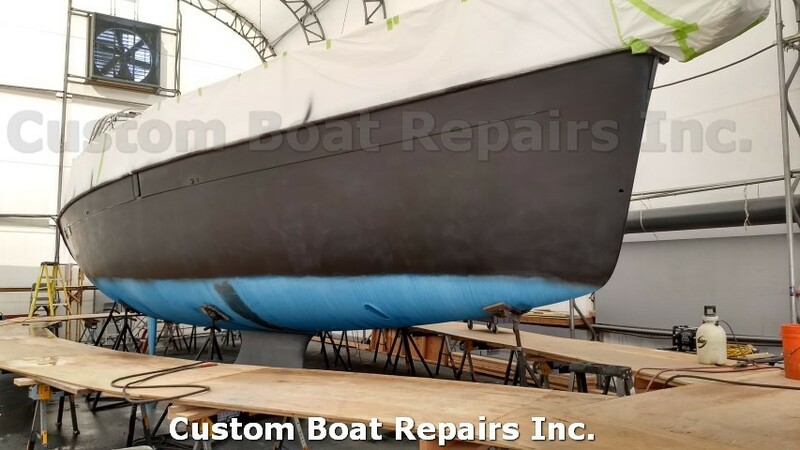 So even if you did remove a part of your boat and ship it off to Awlgrip, the color will more than likely need fine-tuning. So overall, you're kind of screwed. What I use is a hybrid polyester that lets me produce the best matches around -- all different shades of tints, and some that I personnally customize to achieve a faster match. My finish comes out so good, in fact, that it actually faked out a professional boat manufacturer. An owner purchased a 28-foot boat and kept it in a lake in North Jersey. 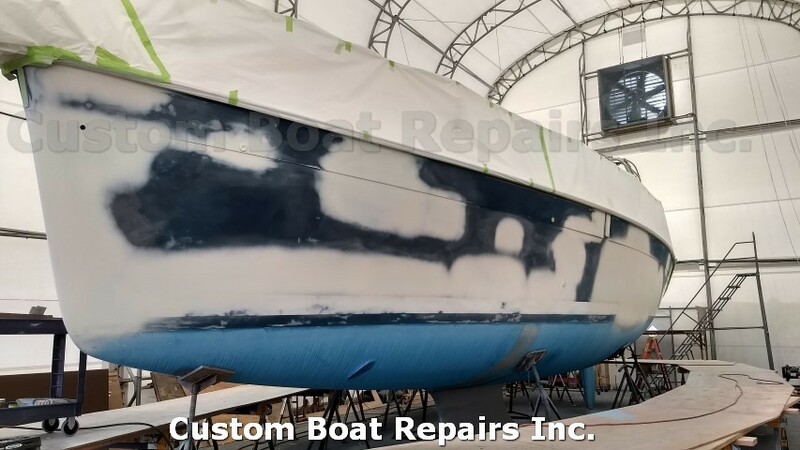 After he'd had it for a few months, he decided to haul the boat to clean the bottom (the bottom was not painted; it was the original gel coat). Well he got quite a surprise when he checked out the bottom of his boat. It had thousands of blisters! 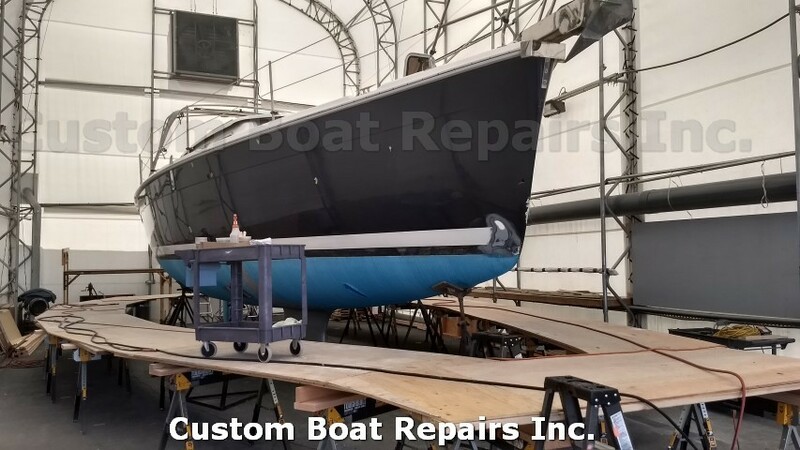 He called the factory and they decided to exchange the boat with a new one for him, as long as there was no damage to the boat. So he planned on towing the boat back to the factory on a Monday, but Sunday night, while the boat was still in the water, a telephone pole wound up in his slip, damaging the boat -- the spikes gouged out both sides of the boat. 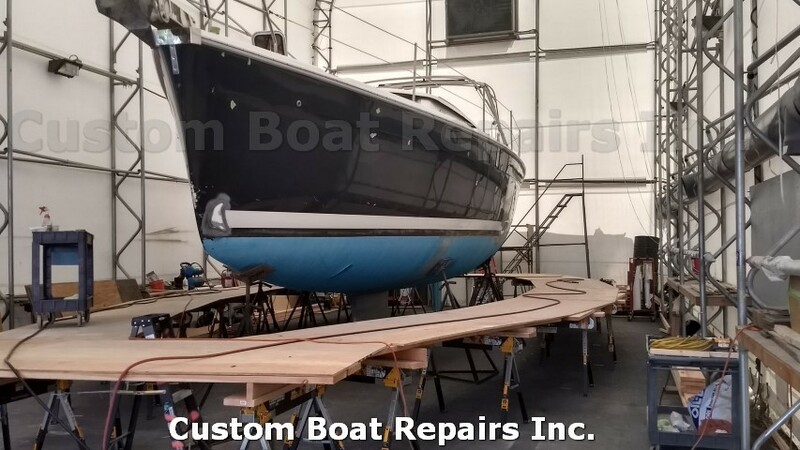 In a panic now, knowing that the factory would not take his boat back with this damage, he got in touch with me, and asked if I could refinish the sides so it didn't look like any repairs had been done. I told him, "No problem." 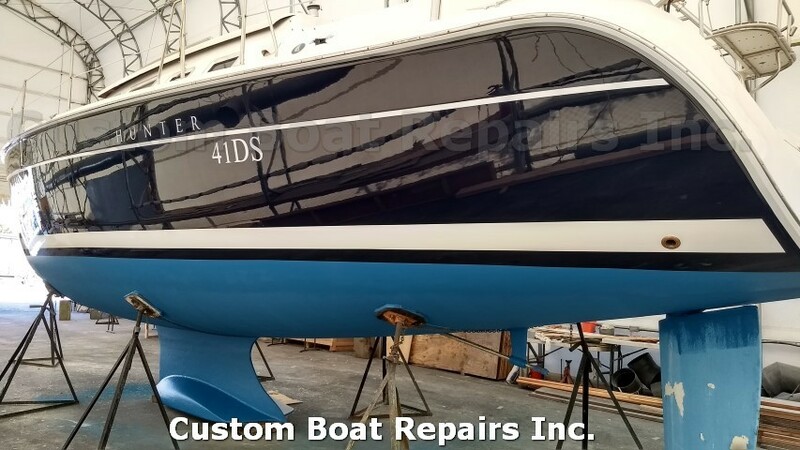 I repaired the gouges and sprayed the sides, and it came out beautiful, and the boat owner was super happy. But now for the test. He brought his boat back to the factory and they went over it with a fine-tooth comb. They congratulated him on how well he kept the hull, and gave him a brand new boat. When he got back, he came down to my shop to let me know what happened, thanked me, and then gave me a big tip! In these photos, you'll get a quick glimpse of how I achieved that perfect finish. When I spray, I get very involved in it, and cannot have any obstructions in my way. You'll notice that it's also wide enough to handle the carts, because you don't want to keep bending up and down to get your supplies. Here, you can see the areas that I've repaired. There was a lot of damage to the sides of this boat. 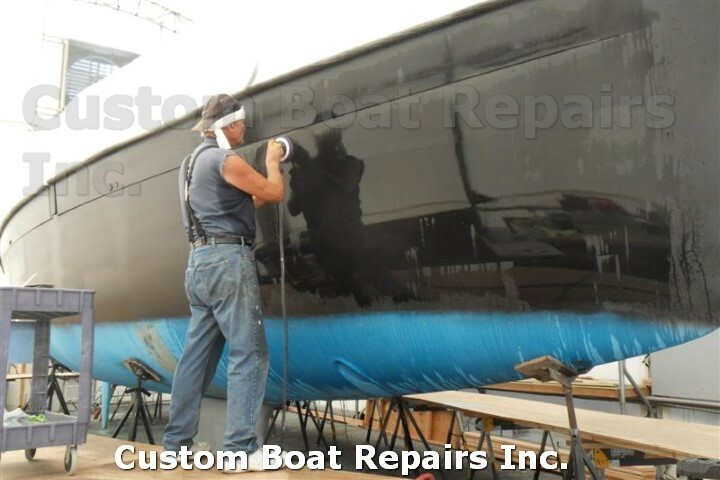 What you're seeing here is a very hard polyester base applied to the boat, and then sanded smooth. Spraying a black epoxy base as a foundation for my finish. Making sure the boat is completely covered. Working down the starboard side. I let it dry for 24 hours. Now I wet-sand the primer until smooth. It gets sloppy, but it has to be done. Sanding done and happy with the results. Getting ready for color. Nine layers of color. Looking good. The water line stripe was sprayed on. The upper stripe was taped, and I had a decal made for the bow. Port side view. Very happy customer!